It is easy to imagine that gradations of Xi exist. One person is, for example, structurally more curious than the other, or knows even fewer boundaries. In other words: extra intense, extra complex, and extra driven. 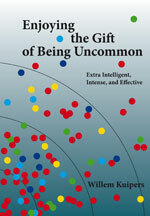 The stronger the extra intelligence is, the more uncommon the XIP is, by definition, and most often, the more important a proper management of this gift of being uncommon will be. 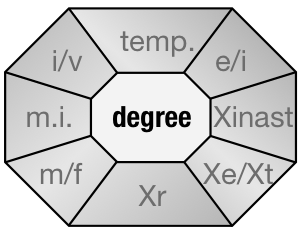 In the figure shown, the degree of Xi is situated in the heart, because it is our experience that it works as a reinforcing factor for the entire Xidentity. The higher the degree of Xi, the more striking some facets will be, while others are more extensive, or one has to deal with them more carefully to achieve maximum expression. When identifying the eight facets of the Xidentity, it is relevant to take this ninth facet into account: the possibility of possessing certain characteristics to a stronger or weaker degree than other XIPs in one’s environment – in other words – to be uncommon within the population of XIPs. With extreme Xi, one can expect communication to occur in a higher gear, the leaps in thought to be bigger… or is there more to it? There is little literature available on extreme adult giftedness (highly gifted and above is considered “extreme”). The size of the group is very small (0,1%). Also the available data are relatively limited and in the light of the group’s diversity, widely varied. Based on literature, but also on our own observations, we have established that extreme XIPs indeed go a step further in cognitive ability. Compared with individuals of average intelligence, XIPs are well able to structure information in a new manner, and therefore to make new relations between areas that were initially separated from each other. Where averagely intelligent individuals are skilled in analysis, XIPs are also strong in synthesis. Extreme XIPs are able to simultaneously analyse and synthesize. They work with a helicopter view but at the same time watch every move of the ants on the ground. They do not lose themselves in details, and their perception is both global and detailed. This is the result of extremely efficient information processing, which for them takes place automatically. That is why they are perfectly suited to create systems that are founded on new paradigms. Successful exceptional historic examples are Newton, Einstein and Madame Curie in the sciences. More recent and different examples are Tim Berners-Lee, the inventor of the World Wide Web, Balanchine in ballet, Glass in music, Picasso in the visual arts, or Johan Cruijff in soccer. The most formidable opponents of the effective expression of their excellence can be the extreme XIPs themselves. They apply their superior capa­city for information processing to their environment, and pre-eminently to themselves. The speed with which they think things through or think up a new concept is rarely in proportion to the time required for its realization or materialization. So they follow their own actions extraordinarily critically and each aspect of apparent failure is observed faultlessly. The existential question posed by many XIPs: “Am I good enough?” has long been translated as “I’m never good enough.” The reasons may vary, but not the conclusion. But when they are in a positive mood, they come up with excellent plans and an uncommon drive and energy to realize them all simultaneously.